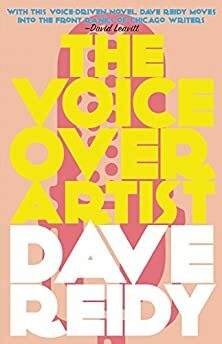 Largehearted Boy: Book Notes - Dave Reidy "The Voiceover Artist"
Book Notes - Dave Reidy "The Voiceover Artist"
Dave Reidy's debut novel The Voiceover Artist is as moving a book as I have read all year, the remarkable story of a young man literally finding his voice. "Reidy's portrayal of Simon’s anxieties and insecurities, both throughout his years of silence and later in his bid to be heard, is moving and honest. The love-hate relationship between Simon and Connor is a stirring depiction of a troubled sibling bond, while the unique insider’s look at the voiceover world is informative and entertaining." In the nearly eight years I spent writing and re-writing The Voiceover Artist, the novel was ever-present to me, if only in my subconscious, where my mind sought any way out of the seeming dead ends into which I’d charged, meandered or stumbled before leaving my writing desk that morning. By some mechanism of neurology or happenstance of psychology, the novel’s characters were likely to surface in my consciousness as I listened to music. A lyric would renew my affection for a vexing creation, or the mood evoked by a melody would deepen my empathy for one of the flawed people I’d imagined into being. In other instances, a song spoke directly to the floundering author. On my better days, I found a way to accept the music’s challenge, chiding, or comfort. The playlist below is no feat of reverse engineering. Each song did its work on me before The Voiceover Artist was sent to print. Like the novel it shaped in small but important ways, the playlist features the voices of various women and men in the hopes of making something dimensional and greater than the sum of its parts. My thanks to Largehearted Boy for the opportunity to share it with you. "Archie, Marry Me" – Alvvays – No matter how many times I listen to it, something in "Archie’s" major-minor-major melancholy nearly brings me to tears. From interviews she has done, I understand that Molly Rankin is singing with her tongue in her cheek, but for some reason, the irony doesn’t dampen the song’s emotional resonance. Rankin’s clear, sturdy voice carries—and passed off to me—the weight of a relationship that threatens to smother a young woman who expresses her restlessness in an irresolvable contradiction: "Too late to go out/Too young to stay in." The Voiceover Artist is a book about relationships—between lovers, exes, siblings, colleagues, and lonely people on the margins—and the tension that Rankin articulates between the appeal of commitment and its threat of suffocation animates, to varying degrees, every human interaction at the heart of the novel. "The Graduates" – Speedy Ortiz – In vocalist and songwriter Sadie Dupuis’ metaphors of academic underachievement—"French-club dropouts," "law-school rejects"—I hear echoes of the helpless obsession with status that is the bane of many and the particular burden of Simon Davies, protagonist of The Voiceover Artist. Where Dupuis’ character attempts to use failure as an opportunity to bond (albeit negatively) with her would-be lover, Simon fears that his every misstep, whether interpersonal or professional, may induce his re-banishment to the social isolation he experienced during eighteen years of muteness. Dupuis’ lyrics in the first chorus—"I was the best at being second place/But now I’m just the runner-up/At being the second one you think of every day"—capture Simon’s fear that second place is never good enough for the people we may love, that any failure now will leave him as solitary as he had been before rebuilding his voice. "In the New Year" – The Walkmen – Simon’s long silence robbed him of his adolescence. By the time he rebuilds his voice at age twenty-five, he is a sort-of adult, uncommonly wise in some ways, hopelessly naïve in others, and dead set on reclaiming what his muteness has cost him. The Walkmen’s masterwork "In the New Year" expresses a similarly curious blend of naiveté and defiance: "I never hear the bad news/And I never will/We won by a landslide/Our troubles are over." By the end of the final verse, the song’s main character has achieved some measure of worldly understanding: "Finally," he says, "I opened my eyes." But the character’s naïve (or is it wholly defiant?) optimism bobs to the surface in the song’s final words. Perhaps addressing his departed beloved, he says, "I’ll see you in the new year." "Strangers" – The Kinks – The Voiceover Artist is propelled by a richly dysfunctional relationship between siblings. The same might have been said of The Kinks. "Strangers," written and performed by guitarist Dave, the younger and less celebrated of the Davies brothers, can be read as a song about lovers, but I hear in it the strained-but-unbreakable intimacy of brothers who—sometimes willingly, sometimes not—have shared a lifetime: "Strangers on this road we are on/But we are not two, we are one." "Volunteers of America" – The Both – When she first appears in The Voiceover Artist, Catherine Ferrán is a woman with a place in the world: her own business, intimate friendships and, until recently, a marriage. After her divorce, she wanders into a withering Catholic parish in her well-to-do Chicago neighborhood and becomes, for a substantial number of misfits who congregate at the church, the only reliable link to services, support, and conversation. As her own life mutates beyond her recognition and her place in the world is threatened, Catherine asks herself (in not so many words) a difficult question: Under what circumstances can freely assumed responsibilities to other people be relinquished rightly? The same question lurks within Aimee Mann’s and Ted Leo’s "Volunteers of America," the lyric of which addresses a character who is unable to limit a habit of self-sacrifice: "So bring out your poor, your washed on the shore/Your refuse, your teeming depressed/You take them all in, ‘cause that’s where you’ve been/A person who has to say, 'Yes.'" "I Am Trying to Break Your Heart" – Wilco – This is the sound of Chicago artists making something they know not everyone will love. "A Quick One, While He’s Away" – The Who – Forgiveness, in the granting and the refusal, figures prominently in The Voiceover Artist. The exultant conclusion of Pete Townshend’s first foray into operatic pop—"You are forgiven," his character sings again and again, wiping away the guilt of his lover’s transgressions as he might her tears—set the bar for the surprise and transcendence I wanted for the novel’s climactic, conflicted moment of forgiveness. "Roadrunner" – The Modern Lovers – In his paean to the AM broadcast band, Jonathan Richman extols radio’s power to transport him beyond the Massachusetts suburbs, beyond the range of what fuel he can afford to pump into his car on any given night. Though he is obsessed with commercial spots rather than rock-and-roll, a teenage Simon Davies experiences, as Richman did, the vast geographic reach of radio and envisions its power to lead him into a wider world. I find it incredible that even today, long after television dethroned it and video killed its star, radio can so completely (if only momentarily) take us places we’ve never been and make us feel as if we know people we will never meet—incredible, too, that a novel, in this visual age, might achieve the same things.